After an operating system upgrade to 10.9 – Mavericks, there was a notable slowdown in day to day performance of my Macbook. Running Chrome, Firefox, Skype, iTerm, MacVim, Excel and a few more applications together would quickly max out the 4GB of existing memory. If you’ve any experience with upgrading RAM on a PC, upgrading your Macbook’s memory is just as easy. Here’s a quick summary of what I’ve found to be helpful when performing my own upgrade. Look up your Macbook Pro model here to determine the specific memory modules you’ll need. If you’re buying memory in India, try flipkart.com or a local hardware vendor. The vendor I purchased from sold me 2x4GB modules of DDR3-1333 for Rs. 2,400 each. You’ll need a precision screwdriver set with a phillips 00 screwdriver head to open a Macbook. Simply follow the earlier Apple support article or this article on Corsair’s blog with helpful pictures of a Macbook Pro 17″ through each of the upgrade stages. Newer Macbooks may have the same layout as the older ones. I have a 13″ late 2011 model. If your model is similar, you shouldn’t have to remove the battery to replace the memory modules. Keep the screws in the order that you remove them. Be careful, this is important. Each screw has a different length. I used slim, sticky post-its with numbers to keep track of the order in which each screw had been removed. On messing up the sequence, I found that the screw may or may not fit in the laptop chassis. So stop right there if you discover you need to apply greater than necessary force in getting the screw back in. Total time to finish replacing the modules was less than an hour. Hope this spurs you to get an upgrade on your Macbook, especially if you’ve been putting it off. After the upgrade I no longer experience otherwise familiar moments where the machine pauses ungracefully. 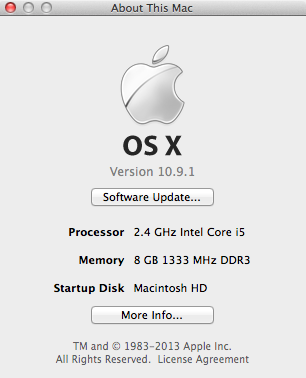 On the other hand the machine hasn’t yet max’d out the 8GB at its disposal.